Last summer, I worked as a GS-4 Park Guide. When I showed interest in pursuing the National Park Service as a career, my supervisor admitted me into the NPS Pathways Internship program. When Dr. Van Sickle informed me that Pathways could be used for course credit, I jumped on the opportunity. The most valuable part of this internship has been having the opportunity to engage in conversation with people from vastly different backgrounds, states, and even nationalities. Most of the people that come through our park are genuinely interested in gaining a full understanding of our history, and sometimes you can even delve into some of the in-depth, controversial topics. Well, Pathways will provide an easier route to a career with the National Park Service. The true benefit is much more abstract. 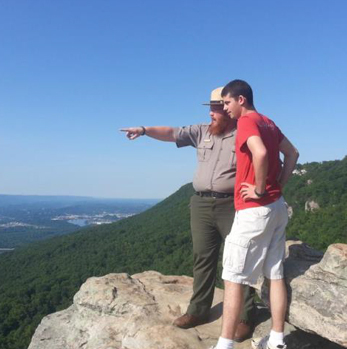 My two summers working at Chickamauga & Chattanooga NMP have provided invaluable experiences and skills that will follow me throughout my career. I have had the opportunity to relate accurate history to audiences from all over the world, and in this regard, I feel that I have been able to serve as a true steward of American heritage. By learning from the bad along with celebrating the good, we can get a real sense of what this country is and what it can become.